Chelsea boss Jose Mourinho says this term's Premier League will be the most competitive he has experienced - with even newly promoted Bournemouth buying players good enough for his side. 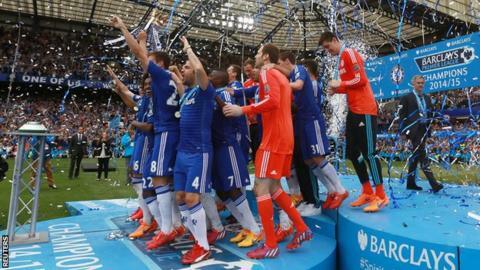 Mourinho's Chelsea eased to the title last season, finishing eight points clear of runners-up Manchester City. But the Portuguese cited Bournemouth's signing of Max Gradel as evidence this season will be tougher. "Gradel could play for Chelsea," Mourinho said. Top-flight clubs have spent more than £500m so far in the transfer window, partly fuelled by a new £5bn Premier League TV rights deal. Mourinho has also been impressed by Yohan Cabaye's £10m move from PSG to Crystal Palace and Newcastle's capture of £14.75m Georginio Wijnaldum from PSV as well as Gradel's arrival for a reported £7m. And the Chelsea boss, whose side were beaten 1-0 by Italy's Fiorentina in a pre-season friendly at Stamford Bridge on Wednesday, said the strength in depth across the league means fewer points will be needed to win the 2016 title. "There will be more times when the non-title contenders win matches against the title contenders," he said. "It's also difficult because they have players who could play in our teams - Cabaye could play for Chelsea, Wijnaldum could play for Chelsea, Gradel could play for Chelsea. "You have a minimum of five title contenders and the other teams get stronger and stronger." Favourites Chelsea have so far only signed £8m goalkeeper Asmir Begovic to replace Arsenal signing Petr Cech and brought in Monaco striker Radamel Falcao on loan. By contrast, title rivals Manchester City broke their transfer record to sign £49m Raheem Sterling from Liverpool - while the Merseyside club have signed £32.5m Christian Benteke and £29m Roberto Firmino. Similarly, Manchester United have spent £83m so far, including £31m on Netherlands winger Memphis Depay. Lower down the table, Crystal Palace broke their transfer record to bring in Cabaye while Stoke's eight summer signings include two Barcelona players. Both Watford and Bournemouth were promoted to the Premier League from the Championship, along with Norwich City. But with two of last season's promoted clubs, Burnley and Queens Park Rangers, relegated after just one season, the Championship champions and runners-up have so far signed 19 players between them. "I think nobody can complain because everyone is investing - you go to Watford, you go to Bournemouth, Crystal Palace, Stoke, every club," Mourinho said. "Every club has very good players so I think it's difficult for the top teams in England because of the competitive nature." Chelsea start their title defence at home to Swansea on Saturday. Who will finish where in Premier League? Read more on Who will finish where in Premier League? Think you know the offside rule? Read more on Think you know the offside rule?